For some legacy reason, the file formats for Garmin-compatible maps differs between Windows and Mac OS X. Even Garmin’s own Mac BaseCamp application does not support Windows’ BaseCamp maps. There are two methods for converting Windows Garmin-compatible maps to BaseCamp for Mac: 1) on a Windows XP or later computer, or 2) on a Mac. If you have maps on a Windows computer already, and would like to move them to a Mac, then you are in luck. Simply download and install Garmin’s MapConverter on your Windows computer. Apparently it can convert your maps to the Mac format. If you only have a Mac computer, there are two free utilities available to that convert Windows Garmin-compatible maps to the Mac BaseCamp-compatible format: JaVaWa MapConverter and Gmapibuilder. Both have a graphical user interface, but I found JaVaWa MapConverter easier to use. You will of course need Java installed on your Mac, which it may not be by default. I use the Ibycus Topo Canada map as my main map for off-the-beaten-path adventures. 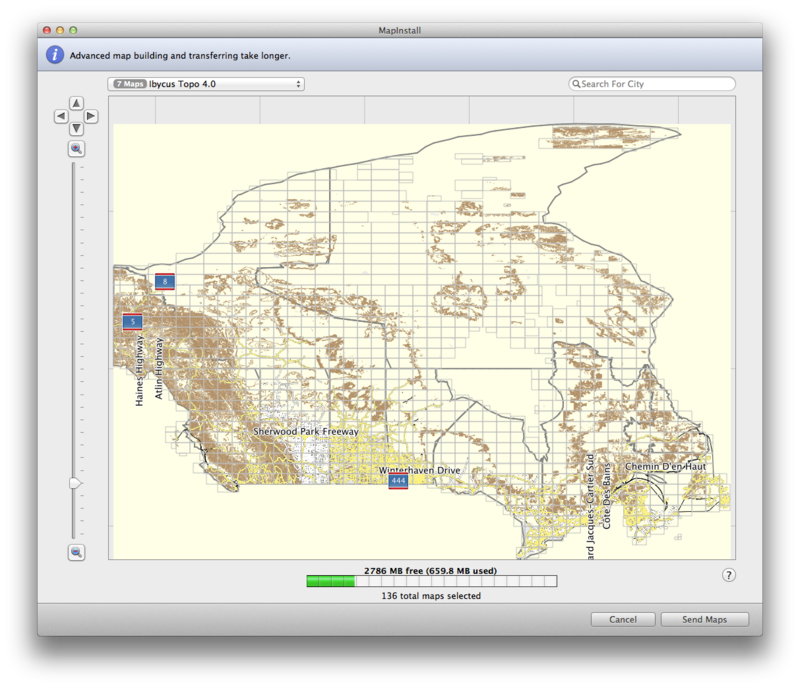 Because this is a very large map, Ibycus does not distribute the files directly. You need to download a copy using BitTorrent. I was able to find a copy of version Ibycus 3.2 for Mac, but I could only ever find the Windows version of Ibycus 4.0. Today, I was able to convert Ibycus 4.0 to Mac .gmap format, and I thought I would use that as an example of converting Garmin Windows maps for use on a Mac. (Caveat: since JaVaWa is a free tool and not supported by Garmin, it is not guaranteed to work, and I have no idea how it works with locked maps). I will assume you have your Windows map files already. Launch JaVaWa MapConverter (on OS X 10.8 and later, right-click on the JaVaW MapConverter application icon the first time and choose the “Open” menu item — this will ask if you want to bypass OS X’s developer signing restrictions — click the “Open” button). Ibycus Topo 4.0 is downloaded as an ISO file (this is a DVD disk image). Double clicking the ISO file will mount a new disk on your computer. Copy the entire contents of the Ibycus Topo 4.0 disk image to folder on your hard drive — you are going to move some files around and the disk image is read-only. Move the following files from the folder you created in step 3 and into the “imgs” folder. Now, drag the “img” folder onto the JaVaWa MapConverter window. When asked to select the “.img” file, choose “Ibycus Topo 4.0.img” from the drop down menu. JaVaWa MapConverter should now be ready to convert the file. Click the “Convert” button and choose where to save the .gmap file. After JaVaWa MapConverter is finished, in the finder, go to the saved .gmap file. Double-clicking it will open Garmin’s MapManager application which will ask you if you want to install the map. Click “Install”. You can now relaunch BaseCamp and use the map. You can also run Garmin’s Map Install application to install Ibycus Topo 4.0 map segments onto your GPS receiver. You can now eject the disk image mounted in step 3 and delete the folder created in step 4. You might want to keep the “IbycusTopo40.iso” and the “Ibycus Topo 4.0.gmap” files for later. There is another map on the ISO that you might want to convert as well. Repeat steps 2 through 10, this time with the files named “Ibycus – Old Roads 1.0.img”, “Ibycus – Old Roads 1.0.MDX”, and “Ibycus – Old Roads 1.0.TDB”. This Map contains old roads that were removed from the Government of Canada datasets between versions of Ibycus Topo. Personally I don’t have a need for the “old roads” map, but it is there if you want it. Depending on the source of the Windows Garmin map, the file and folder layout may differ slightly. As the JaVaWa MapConverter documentation states, it is simply critical that the .tdb and .img files be in the same location. The .mdx and other files are optional, but if they are provided, JaVaWa MapConverter will use them. For JaVaWa MapConverter all the files need to be in a single folder. Gmapibuilder seems more flexible — you can locate the required files individually.